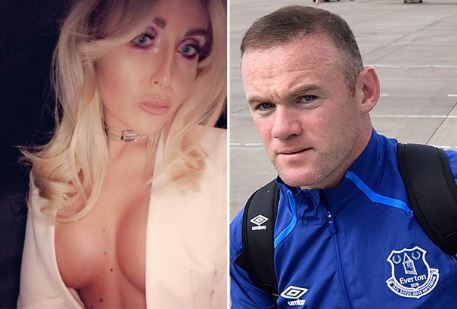 Laura Simpson, the ‘party girl’ who got Wayne Rooney into trouble after he was arrested for drinking and driving while behind the wheel of her car, has made an awkward remark about the size of his manhood. Recall that Simpson claimed they only ‘kissed and cuddled’ after they enjoyed a whirlwind night boozing at a bar before he was arrested on the 1st of September. But, according to The Daily Star, the ‘party girl’ who has left Rooney’s marital home in jeopardy hinted that things went a little bit further between them. During a late-night Twitter exchange with a fan of Manchester United, the footballer’s former club, the 29-year-old office worker discussed the size of his manhood. When the fan asked details about her encounter with Wayne Rooney. Laura wrote: ‘Shrek has got tekkers,’ a slang for technique. Saucy Laura then responded: ‘Like an ogre,’ prompting an amused response from the fan. The party girl later deleted the conversation and apologised for getting nasty about her experience with the former England captain. Meanwhile, ever since the whirlwind night boozing and drinking and driving incident came to light, Rooney’s wife Coleen who’s pregnant with their fourth child has stopped wearing her wedding ring.